"There are two ways of moving men, interest andfear." The knowledge contained in this book Iacquired over a period of about twenty years. I had at first no specific interestin health, I took it for granted along with steak and onions, and apple pie and cream.It was my wife's indifferent health and later on, the heart attacks (at age 42) oftwo of my pilot contemporaries, that got me thinking. The living proof described in this chapterare real people who have side-stepped Algy Virtue's fate in the nick of time andwho are healthy and vigorous again. Their introduction now is intended to stimulatethe readers' interest ahead of the chapters which may tend to generate a little fear. * Since the first printing of The Health Revolution	in 1981, the author has accumulated sufficient testimonial letters to fill this entire	book. The letters describe recoveries from every common metabolic disease, including	cancer and MS. Cases of heart disease, claudication, diabetes and arthritis comprise	most of the letters because not only are these complaints the Most common, they are	also the most easily corrected. My wife Joan had never been in very goodhealth--she smoked, drank coffee, took aspirin for frequent headaches, sometimesmigraine, had bouts of asthma and over a period of maybe twenty years had lots ofdoctors' consultations, lots of medicine. I became interested in nutrition whenI realized the medical system was virtually useless, and so began to read all thebooks I could find on the subject of nutrition and health. I realize now that a lotof them arrived at false conclusions and gave wrong advice, but all helped, somemore than others. After her first close call with diverticulitis,and recovery with the benefit of a long stay at the Hopewood Health Center,* my wife'sbad habits were resumed and it was evident she was heading for worse trouble. InJune 1975 she had a massive heart attack. With the help of a temporary pacemakerand weeks in intensive care, she eventually made it home again. * The Hopewood Health Center at Waliacia, N.S.W. has been established for many years and has been successful in restoring many people	to health using a vegetarian diet regimen. More recently established, the Hippocrates	Health Centre at Mudgeeraba, Queensland, is achieving some success. Now people in this position should realizethat because they let you come home does not mean the heart disease has gone away.Unless you follow a strict lifestyle the condition will worsen and your life expectancywill be short. This happened to her and for a second time she very nearly died. Shehad five return visits to hospital without, fortunately, any further permanent damage. As these repetitions could have had butone inevitable result, I arranged for Joan to undergo a series of thorough testsat Prince Henry Hospital, which included an angiogram,* to assess her capabilityto exercise. I had in mind Dr John Scaff, a cardiologist of Honolulu. I had met DrScaff through Dr Kenneth Cooper (author of Aerobics) and knew that he had trained25 of his heart attack patients to run in the Rimner Pacific Marathon (26 miles)in December 1974. *An angiogram is an x-ray study of the arteries	of the heart or of arteries elsewhere in the body. "it shows, as expected, that shehas a complete blockage of her right coronary artery and of her left anterior descendingbranch of the left coronary artery. There is, moreover, a severe lesion in the circumflexartery. Thus she has triple vessel disease, and in addition, an area of anteriorinfarction with aneurysm formation." Surgery was considered but ruled out becausethe arteries were too bad. Then she got so bad she could only walk a few feet andwas constantly near collapse. Her heart was missing every third or fourth beat. Standing on the front lawn that morningafter his emergency call, her doctor told me she was dying. It was pretty obvious.So once again into coronary care. This was in July 1976, a month I shall never forget. Dr Scaff, by this time, had the report.I phoned him in Honolulu. He said she was dying and that he could not help her buthe could arrange surgery there ($15,000 just for the operation). She couldn't evenhave made the flight and I felt it was the end for her. I had a cutting of a newspaper report(Sydney Sun, December 10, 1975, page 106) about spectacular recoveries achievedin such cases by the treatment at the Longevity Research Institute in Santa Barbara,California, but I thought I was already using their system. I was carefully supervising her diet aswell as I could and she was eating no meat or dairy products, no sugar, no salt.I figured I had it all right and ensured that she consumed plenty of polyunsaturatedvegetable oil, as recommended by the National Heart Foundation, the best and mostexpensive cold-pressed variety. But I was wrong, I got up one morningand dug the clipping out of my files and read it carefully. And there it was rightbefore my eyes . . . "the diet calls for a reduction of fat intake both saturatedAND UNSATURATED to 10%". The penny dropped like a ton of bricks, I grabbed thephone and with the special help of the international operators found myself withina few minutes talking to Nathan Pritikin in Santa Barbara. I did not know who hewas, his name had not even been mentioned in the news report. I told him the situation and read thephysician's report to him. His reply was clear and direct. "Yes, we can helpyou, we have had a great deal of success with patients in this condition." Hiscalm manner of speech as he quickly briefed me filled me with confidence. The confidencewas not misplaced. I proceeded straight to the Prince HenryHospital, explained to Professor Wilcken, the senior physician, what had to be doneand he cooperated instantly by calling the dietician. I sat on the end of my wife'sbed and wrote out her meal schedule on the spot. The dietician, a young lady, scannedthe menu and said, "What about protein?" but did not protest, so the programwas started. *Small amounts of essential fats are necessary	in any diet. Natural foods contain adequate amounts of protein and essential fats,	and it is almost impossible to reduce these components below a safe level. So she was put on this diet forthwithat the hospital and the improvement was virtually instantaneous. In three days shewas walking all over the place. In a few more days her exercise routine commencedon the exercise bicycle, a few minutes at a time. Two weeks later she was doing 10 minutes,twice a day and was soon allowed to come home. That was in 1976. She is now livinga normal life; drives a car etc., and, glad to be alive, is being more prudent atthis time. Incidentally, she can read clear type now without glasses, which she hadnot been able to do for years. "On examination there were no signsof cardiac failure, her blood pressure was normal and, interestingly enough the apicalsystolic murmur which was quite prominent when I last listened to her was no longeraudible. "I think this does indicate someimprovement in ventricular function and perhaps posterior papillary muscle function.The ECG is pretty much as before as one might expect but the echo we did, I think,is consistent with some marginal improvement. The posterior wall moves a little betterthan previously although it is clearly impaired in its movement. The septum is fairlyflat--not moving much at all really." Here, in their own words, are the storiesof some other people right here in Sydney, Australia, who have made dramatic recoveries. "Whilst gardening at home one Saturdayin September 1976 1 suddenly felt waves of nausea and then collapsed on the grass.I managed to stagger inside and fell on my bed. My wife called the doctor who tookone look and sent for the ambulance. I had had a heart attack. "Lying in intensive care in RoyalNorth Shore Hospital, I was covered with wires and tubes and I could see what lookedlike TV screens with lights moving across them. Time had no meaning, except I knewSunday was Fathers' Day and I felt a rush of tears and self pity. After some daysI was moved into another ward with three other patients, a taxi owner an architectand a farmer. "When I had recovered sufficientlyto return home I decided to have a complete check-up at the Aerobics Center. I failedthe stress ECG and my blood tests were bad, but whilst there I happened to meet RossHorne, and this meeting changed my life. Ross spoke convincingly and gave me greatencouragement; I decided to follow his advice. "I adopted the Pritikin diet andcommenced a walking program. A friend of Ross, Marlene Pentecost (author of CookingFor Your Life) provided my wife with cooking recipes and advice. Ross was mychief instructor who, although a busy man as a senior Qantas pilot, always foundtime to advise me. "Since embracing the program I havefelt uplifted in spirit and my health has improved steadily. In summer I swim 30laps of my pool. I have found again the desire to work and help others. I have resumedwriting and apart from magazine articles, have just written a book. The book is mylife story, and I've called it Take It Easy. "Dear Ross, I'd like to say how excitedI felt after reading your book. I wish it had been available 18 months ago when Iwas so desperately searching for an answer to my illness. "Briefly, after a number of stressfulyears, in the early part of 1980 1 discovered a lump in my breast. Six months laterI had a biopsy, the results [of] which proved [it] to be malignant. Believing cancerto be a fatal disease, I was devastated. "The following weeks placed me ingreat turmoil, thinking I had no other choice but surgery. At this time I was livingon Magnetic Island and a dear friend gave me two books to read--Edie May's HowI Cured Breast Cancer Naturally and Max Gerson's A Cancer Therapy, The Resultsof Fifty Cases. "I started thinking maybe--just maybe--therewas an alternative to conventional medicine. In face of opposition from the doctorsand my family I decided to pursue the methods outlined in these books. Refusing surgery,I started on a natural raw vegetarian diet, exercising and swimming in the sunlightand fresh air. "I started feeling better and becameaware that my previous eating and living habits had been completely wrong. "Six months later I returned to myfamily in Sydney and because of their concern, I had another medical examination.Extensive tests revealed no cancer. Not convinced, the doctors pressed me to havechemotherapy and radiotherapy. "Feeling confused because of oppositionfrom my family and the medicos to what I knew was right, I was introduced to youat just the right time. You were able to reinforce my convictions and more. Yourencouragement and support has been wonderful and I cannot sing your praises enough.I know your book is an answer to all disease and hopefully people like myself willfind a new way of life through you. "Something which could have beendevastating has changed my whole way of life for the better. May God bless you andagain thank you for your personal help and encouragement. I now run my own businessand have never felt better." "You may remember my writing to youin January of this year, relating briefly my history as regards my triglyceridesand cholesterol levels, and how, since reading your Health Revolution book, my triglyceridesand cholesterol levels have for the first time in the eight or nine years since Ifirst had them checked (and found them to be raised quite high), been towered to"normal", thanks to the Pritikin diet and you. My latest blood test resultis even better showing my triglycerides at 1.5 and the cholesterol at 3.6. "My main reason for writing to youagain is to tell you about my father-in-law who lives in England, he is 58 yearsold, totally blind and has only one leg (the result of an explosion at age 14). BeforeChristmas 1982, he wrote to tell us that he was suffering from angina, and then atthe end of January 1983, he informed us that because he could now only walk about20 feet before suffering a severe angina "attack", and because his generalcondition had worsened, he would be undergoing a triple by-pass operation on March11th this year. He was obviously very worried about his prospects, so I talked tohim at length on the telephone about the Pritikin diet and also purchased anothercopy of your Health Revolution book and sent it to him. "On receipt of the book his wiferead it to him, and also re-read all the relevant parts on triple by-pass operationsetc. He immediately put himself 100% on the diet and exercise plan, and set aboutcuring himself. "One week before his date for theoperation, he was walking all over the place, his angina pains non-existent and hefelt so much better all over, and so requested another angiogram which showed hisatherosclerosis reversing. The surgeon said he didn't know why this was and alsosaid the condition would probably stop reversing soon and continue deterioratingagain. He also said (when told by my father-in-law about the Pritikin diet beingresponsible for his getting better) that one should ignore such 'fad diets', andeven if somehow the diet did reverse my father-in-law's condition, he would neverbe able to walk more than two miles. Well, he's already proved the surgeon wrongon that count as well! "Anyway, the surgeon agreed thatthe operation no longer appeared necessary and was therefore cancelled; another successfor the Pritikin diet. "I got into conversation with a strangerin my local library some time in January; he was due to have his gallstones removedand was searching for a suitable diet to go on after the operation, but after introducinghim to your book, he took my name and phone number and off he went, proclaiming thathe was going to tell his doctor that he would not be having the operation until hehad given the Pritikin diet a chance first. "Two weeks ago, I received a telephonecall from him informing me that he didn't have the operation, and a subsequent examinationand tests have shown that his gallstones have almost completely dissolved. "A lady friend of my wife has, sincethe age of puberty, experienced a heavy loss of blood during her period as well aspremenstrual tension, but since going about 80% on the diet, she experiences no premenstrualtension and hardly any blood loss. "After previously attempting to ridiculeme because of my weight loss, workmates are now beginning to realize that what Ihave been telling them recently makes sense. In fact, now six are 100% on the dietand about another eight are partly on it, which probably explains why none of thePerth or suburban book shops have any copies, or can't obtain any copies of the HealthRevolution, and also most libraries have a waiting list for it. "I don't know if you are aware ofit or not but on April 3rd, 1983, in Western Australia's Sunday Independent,there appeared an article about a man named Graeme Prosser who had cancer of theprostate and a tumor covering the lower third of his bladder. The article mentionedMr Prosser reading your book and now, after he and his family followed its strictguidelines, it described how his monthly biopsy finds him completely free from cancer. The following is a case history of NHSmember, Trevor Green of Sydney. It is so wonderful that the message must be broadcastloud and clear! "Eighteen months ago I received thenews that I had triple artery disease--right descending artery blocked, left descendingartery 70% closed, and the third smaller artery 30% closed. The surgeon I was consultingconfirmed that open heart surgery was desirable and that if I did not have it thechances of having a third heart attack were real in the next five years and thatit could be fatal. At that time I had just heard about the Pritikin Program whichis as you know, a health program similar to the ideals of NHS with the exceptionof oils and fats not being part of the diet. I had read Ross Home's book, TheHealth Revolution, with great interest because he had made the statement in thebook that if a person followed the regression diet (stricter version) for two years,arteries of the heart would be largely cleared of lesions. The surgeon politely ridiculedthis concept when I discussed it with him and replied to my cardiologist that 'Ihad vocalized false expectations' as to diet. "All this was a tremendous shockto me. I wrote to Ross Horne who replied simply that if I followed the diet assiduously'I would not need an operation'. The problem was whether to be safe, as it were,and have the operation, or take a chance for the two years and see if the diet wouldwork. I am now halfway through the two-year test period and my cardiologist can seethat I am doing well under the diet, though he is reserved about its ability to regressheart lesions once formed. "Well, I can tell you with much gladnessthat not only was I an ideal guinea pig for the purpose of the research project,but also that my heart performance was considered little short of amazing by thecardiologist. At the conclusion of the two days he said to me--'we exercised youto exhaustion point (ie, my legs gave out on the cycle machine--a device like a dentist'schair tilted back with pedals at the base where one is strapped in with many wiresstrapped to the body) and there was no sign of failure in the cardiograph'. He thenadded words which were music to my ears . . . 'If I were you I would not have theoperation'. Another matter which caused them surprise during the tests was the highamount of oxygen in the blood--so good was the oxygen level that it showed up onthe test equipment that I was being administered oxygen. "All these marvellous results aredue to changing to the natural health regimen, eliminating red meat entirely, andmost other meat as well. Of course, I have a long, long way to go yet, but the balancebetween the need for surgery is now on the negative side and this in only 12 monthsof application, though I must say, assiduous application. A much more telling resultwill be when I have a second angiogram--dye released into the heart arteries whichis then photographed and shows precisely the position and extent of blockages. Thiswill be in about one year's time. My cardiologist says if there is any significantresult he will write it up in the Medical Journal." Two years have passed since this letterwas written and Trevor reports continual improvement. Due to change of location hehas a different cardiologist who considers Trevor to be "unique". No furthertests are considered necessary and the cardiologist said not to come back for atleast two years. Written by her fiance, Sean Hanrahan,Editor, Southern Cross Newspaper, Victoria. "Roslyn became a high school teacherthree years ago after working hard at night school to matriculate and then threeyears of university. Together we drank a bit and generally burned the candle at bothends. "For some time Roslyn had experiencednumbness and tingling in her limbs and at first put it down to the cold weather.These symptoms progressively worsened and were medically diagnosed as multiple sclerosisin December 1980. "By February the situation was disastrous;she had symptoms everywhere in her body, she was suffering extreme fatigue and depressionand she was so tired in the evening she had to go to bed at 6 p.m. The doctors saidthat nothing could be done and that it may be advisable to move closer to the hospitaland to come back whenever it got bad. Expecting to become confined to a wheelchair,she advised me to leave her as she did not wish to be a dead weight in my life. "About ten weeks ago, dissatisfiedwith the medical advice, we commenced investigating alternative forms of treatmentand read two interesting books on MS--J.C. Ogilvie's Overcoming Multiple Sclerosisand W. Richie Russell's Multiple Sclerosis--Control of the Disease. Followingthe dietary advice of the former book, after about two weeks Roslyn started to improvesignificantly. Then we read your interpretation of the MS process and were so impressedwe both immediately adopted the Pritikin Program. "Roslyn's recovery was noticeablyaccelerated, and now all symptoms of MS have gone except slightly in her right hand.She looks years younger, and in her own words she has more energy now than ever beforein her life; her spirits are soaring. "For my part I have lost 21 poundsand feel great. We plan to marry at the end of the year." "I had never been sick in my lifeand never gave a thought to my health or my diet. I just took such things for granted.I ate the ordinary food--packaged cereal with milk and sugar, bacon, eggs, etc. forbreakfast. For lunch I'd have some sort of take-away food, maybe fried chicken, piesor suchlike. And in the evening a good home-cooked meal, maybe a grill or a roast. "Running my service station keptme busy, but I really had no worries at all. "One thing I noticed however, wasthat in winter I caught colds, and with each year the colds were worse and lastedlonger. Another thing was that I started getting headaches, usually after a hardday, sometimes in the afternoon, and they were becoming worse and more frequent.In fact about a year ago I was getting a headache, which I called a sinus headache,just about every single evening. Looking back, I remember an occasional chest painwhich I ignored as a minor inconvenience and which never persisted. "Then in August of 1978 1 had a heartattack. I'd just started work when I felt this pain in my left shoulder which graduallyspread across my chest. I went home and my wife had gone out, so I just lay downon the bed. The pain kept up all day and when my wife returned home she called thedoctor who promptly diagnosed the problem and straight away into the Coronary CareWard of Mona Vale Hospital I went. "After a couple of weeks, I stillhad some shoulder pain, but I told the doctor I was pain-free in order to be allowedhome. My local doctor gave me pills to help me with the pain and I just rested athome. "One of my customers, Ross Horne,called up to see me and proceeded to expound a pretty convincing explanation forwhat had befallen me, and with my wife listening, he described what he called 'ThePritikin Program'. It sounded good, so we tried it. That was in September. "In a couple of days my angina hadgone and so had my headaches, and I started to do a bit of light work about the place.A day or two later I started back to work, taking things easy but sticking to thePritikin diet. I haven't followed a planned exercise program, but I do a bit of walkingand jogging occasionally. "And now that's two years ago. I'mdown about 30 pounds in weight over that time, am free of headaches and with thewinter almost over I haven't had one cold. "I reckon I'm back in business inmore ways than one." "Dear Ross, I shall go back to theday when you stood on my doorstep and I was almost ready to throw in the towel. Iam writing this letter as I thought it may help others, through you, who find themselvesin the same boat. I don't think I ever told you the full story, so here I go. "When I met you, every joint in mybody was inflamed. Walking and carrying things, getting up and sitting down had becomea major problem. The severe pain and the savage damage done to my body had takentheir toll. My once slim fingers were staring at me like overboiled sausages, feet,toes turned under or sideways, were too sore to bear shoes on them. I hid all thataway from you with the floating thing I wore, my hands hidden in the pockets . .. rheumatoid arthritis . . .
"The whole thing started in 1973after a traumatic event in my life and by 1976 was severe. I could no longer work,I was on cortisone, clinorils and digesics, my ESR rate was 113. "Some days I could not move at all,other days--well, I could get around the bends. I crawled around the place, fightingwith the taps or contemplating how the hell I was going to get off the toilet seat.I could no longer have a bath as there was no way I'd ever get out of it. To drymy back was almost an impossible job. You see, your shoulders do not let you swingyour arms about. I had physiotherapy twice a week etc. etc. "I had read about gadgets aroundthe house to help sufferers such as myself, things to put on taps, things to helpyou dress, undress, get out of chairs, even gadgets to help you put on your stockings.I think this was the most devastating part of it all; to realise that I needed thosethings as I no longer coped. I wept a lot, my disposition became horrid and I wasnot a joy to have about. I became a complete loner, ready to give up the ghost. Theprospect of having to live my life out as an invalid did not turn me on. "It was at this point that I metyou. I think, looking back at it all, it was a combination of two things; your enthusiasmabout nutrition, your conviction about the Pritikin diet, the remarkable story aboutyour wife, the case histories you quoted to me, and my own desperation, which convincedme to have a go at the very stringent diet sheet. "I must admit, it is not an easything to stick to, but improvements become apparent after a few weeks. I lost a greatdeal of weight and this allowed me to walk small distances, shuffling along in myslippers on the beach, slowly, slowly. Parts of me that had not worked for so longslowly started to operate again. I did not fall flat on my face going uphill, becausemy ankles actually began to bend again. Ross, you have no idea what that meant. Andthen my knees followed, my hips, my shoulders began to come unstuck, I could raisemy arms above my head. This sounds idiotic to a normal person, but believe me, anyonewith this thing knows what I am talking about. Swimming! Marvellous. Hydrotherapy,great if you can get up and get yourself there. That came first. I tried to get towater somehow, as I found the loss of body weight gave me the marvellous feelingthat I could move. "So what I am trying to tell youis that I am almost my old self again. I am back at work again, at full capacity. "The thing is not fully cured, Ross,but I am very mobile. I walk three miles per day, wear shoes again (you have no ideawhat that meant to me). My spirits once more are soaring high. My morale is great.I can handle the days when I am sore. Anger, upset, eating and drinking the wrongthings will all help to throw you back. I know smoking is bad and you will be annoyedthat I haven't stopped, but at least I've cut down on it. "It may sound crazy, Ross, but Ihave learned that our body is not only the temple of the soul, but the most amazingbit of machinery. Feed it the wrong thing and you will end up like a neglected car.I am amazed by the fact that most of me had seized up--yet now I am working again.To be useless and a burden to other people would have destroyed me; that probablymakes me a coward. However, I thank God for sending you along so many months ago.It is a tedious road, your diet, no smoking, no drinking, my body and myself--weare grateful." "Dear Captain Horne, I received yourlast books yesterday and thank you very much for them. I owe you a debt of gratitudefor saving my life. I would of been in my grave now if I had not changed doctorsand then started on your diet. I was being treated for kidneys. "In hospital, it was a battle toget temperature down. I had convulsions, nosebleeds etc. When home I was gettingworse--could not walk and was not able to stand to press my slacks to go to the doctor.When I complained I was told 'Just sit around in a chair'. Ironing was out. So changeddoctor. He took blood tests, ECG, urine test and said it was heart and a pacemakerwas needed. "As I am a war widow I came underRepat and arrangements had to be made. Someone on television recommended a cloveof garlic a day as it was a pick-up for the heart, so I started taking it. Then,going through old papers I had kept, came on your Daily Mirror writing andso started on the Pritikin diet. It was when I went to the doctor to find out whatwas to be done about the heart-pacer. When he examined me he said 'There is a change,something is working'. Asked what I had been doing and what medicine. I told himthat I was eating garlic every day and about the Pritikin diet. The doctor said goon as you are going and he would see me in a few days. Next visit he was very pleasedbut told me not to try and lose weight as the body was too weak. "He is very pleased with me now.Never had any colds in the winter, can go shopping. Going back every week to theCommunity Center. Doing most of the cooking for the family, get up at about 8.30a.m., sometimes earlier. Go all day and as my daughter and husband are cleaners andwork at night I cook their tea and am lucky to be in bed by 2 a.m. I walk some distanceand know my limits. If I have a busy day I get very tired and make the next day easy. "My doctor is very interested inthe Pritikin diet plan. My tablets have been cut down and I have not taken garlicfor a while. It was a real pick-up for me. It used to make the pulse beat better. "I am 75 years and feeling well again.I thank you and hope that you will live to enjoy life, also your wife. May God blessyou." "On New Year's Eve 1980 1 was informedby my family doctor that the blood test I had taken the day before indicated leukemia.Further tests the following day at Royal Perth Hospital confirmed I had Hairy CellLeukemia and that my spleen was grossly enlarged. "The medical specialist recommendedimmediate removal of the spleen as the only course of treatment available for thisdisease. After considerable discussion and thought I reluctantly agreed, and so theoperation was performed on January 8, 1981. "After the operation blood cell andplatelet counts returned to normal but although the Hairy Leukemia Cells were nolonger present in the blood, they continued to be numerous in the bone marrow. "The specialist advised that no moremedical treatment existed. His advice was to wait until the Hairy Leukemia Cellsoverpowered the bone marrow and prevented the production of blood cells, at whichstage (in an expected 18-24 months) chemotherapy would be tried. However, he wasnot optimistic about the chemotherapy as it had always failed in the past. He offeredno other advice but he specifically warned against an organic diet as a useless wasteof effort because no benefits could be expected from its use. "As a positive thinker, I refusedto accept this attitude; I believed I had caused the problem and I believed thereforethat I could fix it. "I suspected that my condition wasa result of unrelenting stress over a long period of time, and this stress, combinedwith my traditional Australian diet, was perhaps the cause of my problem. "I immediately began to discoverall I could about Hairy Cell Leukemia and began also to be concerned about the overallstate of my body. I frequented the medical libraries of local hospitals, I researchedall the medical computer data banks and I read every medical article on the disease.At the same time I began to walk ever increasing distances each day. "Reading the first medical journalarticle was a traumatic experience. Sitting in the Fremantle Hospital medical librarywith tears streaming down my face I gained a chilling knowledge of the survival ratefor my disease. Chemotherapy was a total failure. Patients were reduced to a seriesof numbers, their survival time plotted in months, and few months at that. "Only one medical paper gave a cluethat provided encouragement. It was a South African medical journal and it gave thehistory of one individual patient with Hairy Cell Leukemia who for no apparent reasonhad, over a number of years, eliminated all signs of the disease. "This was all the encouragement Ineeded. If it could happen to that one person, then it would happen for me also. "A friend introduced me to a ChristianBrother who had contracted melanoma seven years earlier. After being told he wouldsurvive only a few months, Brother John Mann adopted the strict vegetarian way oflife and recovered his health. After hearing his story and speaking with others,I became a strict vegetarian in February 1981. "I planned my diet methodically.The first stage was to produce a cleansing process to restore my body to an alkalinechemistry condition. For one week I ate grapes only, every two hours during the day.Stage two consisted of vegetable purée every three hours and the third stage,the mainstay of the diet regimen, consisted of fresh salads, almonds and fruit, togetherwith frequent fresh vegetable juices. After a few months I allowed myself some steamedvegetables as well. "Tests over the next 12 months showedno leukemia cells in the blood, but still signs of them in the bone marrow. However,after 15 months, a bone marrow test at the M. D. Anderson Hospital, Houston, Texas,showed completely clear. "Having experienced natural healingfor myself, reading books about it and talking with others who have been naturallyhealed of various complaints, I am convinced that diet is the answer to all moderndiseases. Diet combined with a worry-free, relaxed mental state, provides the answerto any chronic medical condition. The problem is our so-called modern society cannotaccept something so simple. "Because other people helped me,I have tried to assist anyone who may be in the state of medical limbo that I experienced.It is difficult for anyone in fair health to adopt the strict vegetarian way of life,even though they may accept the logic of it. But when the time arrives--when theybecome desperately sick -it is really very easy, and it works. "At midday on Sunday, May 27, 1974,1 sat down to lunch after a 10 mile run in the Dandenong hills. The day before Ihad run a five mile cross country race at a performance level good for my age of50 years. I was very fit, having participated in this sport for many years. "With my meal in front of me, I suddenlyfound I could not move my arms to eat it, and I was unable to speak. I was havinga stroke. I was taken by ambulance to hospital where my blood pressure was recordedat the frightening level of 300/140. "After a night of intensive carein St Vincents Hospital my blood pressure was reduced with the aid of drugs and Iregained my speech and movement. Two days later I had an exercise stress ECG whichdisclosed I had advanced coronary artery disease and was at high risk for a heartattack. I was placed on medication to control my blood pressure and was warned againstany further strenuous exercise. "After the scare I continued to runeach morning at a much reduced pace, afraid of another blood pressure excursion.After about six months however, I began to experience severe angina pain when running,after covering about two miles. As time went by the pain would come on sooner andits severity increased. "On the morning of March 7, 1975,1 awoke with a severe pain in my chest, so bad that I could not even consider a morningrun. I phoned my doctor and got myself to his surgery. The doctor diagnosed a heartattack and said I should give up running altogether. He arranged a coronary angiogramto determine the extent of the blockage in the coronary arteries and when this wasdone about a month later, it disclosed that the left coronary artery was totallyblocked with varying degrees of closure in the other arteries. Despite this conditionthere was still sufficient circulation to the heart muscle, so in that sense I hadbeen lucky. "I was told that from now on I wouldhave to live on a much higher dosage of drugs to control my blood pressure and tominimize the angina pain which was brought on by the least exertion. I was told acoronary bypass operation was not immediately necessary but could be carried outif my condition further deteriorated. I was not to run and not to lift anything heavy. "I continued with my ordinary dietwhich, following the advice of the National Heart Foundation, contained polyunsaturatedfats in the form of safflower and maize oil and margarine instead of butter, withreduced intake of animal fats from meat and dairy products. I refused however to'hang up my running shoes', and a couple of months after my heart attack I recommencedrunning between two-and-a-half and five miles at a very slow pace with the aid ofan Anginine tablet under my tongue to subdue the pain. "Thus I existed uncomfortably, andoften painfully, until November 1976 when I read an article on diet in Runners'World, written by Nathan Pritikin. I immediately realized the mistake I had beenmaking by using oil and margarine and began to understand what I must do. I realizedthat by eliminating the harmful substances from the diet, that degenerative diseasescould be totally avoided, not to mention the aspect which appealed so much to me,that artery closure could be reversed if the dietary principles were properly implemented. "So I immediately set about adoptingthe Pritikin Regression diet and it was not long before I found my running performancewas improving. I gradually increased my daily mileage, feeling better and betterwhile using less and less medication, my blood pressure still under control. "By April 1978 1 was running up to60 miles per week and on May 2, 1 ran 23-1/2 miles so comfortably I decided to enterthe Victorian Marathon Championship. So on June 17, against my doctor's advice anddespite warnings of sudden death from arrythmia, I competed in the 26 miles openevent and finished rather painfully in 3 hours 31 minutes 50 seconds. "From then on I have maintained mynew diet, increased my mileage, run more marathons in faster time, feeling strongerall the time. 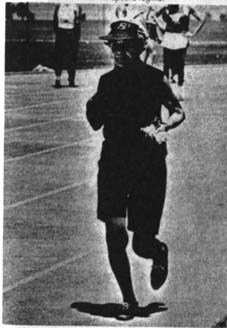 In November 1980 in my tenth marathon, I broke the three hours, finishingin 2 hours 48 minutes 48 seconds. In April this year (1984) 1 completed my 22nd marathon. "As a member of the Pritikin Lifestyleassociation in Victoria, observing the benefits to many others from this "newway" of living, I naturally recommend it to all." Immediately following is a reproductionof one page from the original Longevity Research Institute paper titled "Dietand Exercise as a Total Therapeutic Regimen for the Rehabilitation of Patients withSevere Peripheral Vascular Disease". This paper was presented at the 52nd AnnualSession of the American Academy of Physical Medicine and Rehabilitation in Atlanta,Georgia, on 19 November 1975, and which originated the Sun newspaper reportof 10 December 1975 which happily I noticed. A reproduction of this news item isshown at the beginning of this book. Our study has indicated the promising	rehabilitative potential of a diet and activity regimen for claudication patients. That age need not be a limiting factor in rehabilitation is demonstrated by the case	of a woman, E.W. : She began, almost 6 years ago at age 81, using the same regimen	described in this paper for the experimental group. Her symptoms, like those of the	study patients, included other atherosclerotic manifestations besides claudication. Only 5'3 " tall and weighing 100 lbs for the last 40 years, she had developed	cardiovascular disease and was treated for angina at age 67. At age 75 she was hospitalized	with severe heart attack, and at age 81 had claudication, congestive heart failure,	hypertension, angina and arthritis. When she began the regimen at age 81, her claudication	limited her walking to 100 feet and even then the calf pain was so disabling she	often had to be carried home; and the circulation to her hands was so impaired she	wore gloves in the summertime. Last year, at age 85, and after	4 years on the regimen, she was televised at the Senior Olympics in Irvine, California,	where she won 2 gold medals in the half-mile and mile running events. This year,	at age 86-1/2, she repeated the runs and now has 4 gold medals. Each morning she	runs a mile and rides her stationary bicycle 10-15 miles; twice weekly she works	out in a gym; and she follows her diet assiduously. Her systolic pressure is 70 mm. This combined low-fat diet and	exercise approach has proven to be significantly (p <.001) more effective in the	treatment of severe peripheral atherosclerotic vascular disease than current therapies. It is hoped that the results	reported by the use of this regimen will encourage other investigators to repeat	our studies. Diet and exercise as total therapeutic regime. Patient E.W. running the mile eventat the Senior Olympics in Irvine, California.E.W. was 85 years old when this run was made.